Visit the exclusive Grand Canyon Western Ranch for a taste of the Wild West! 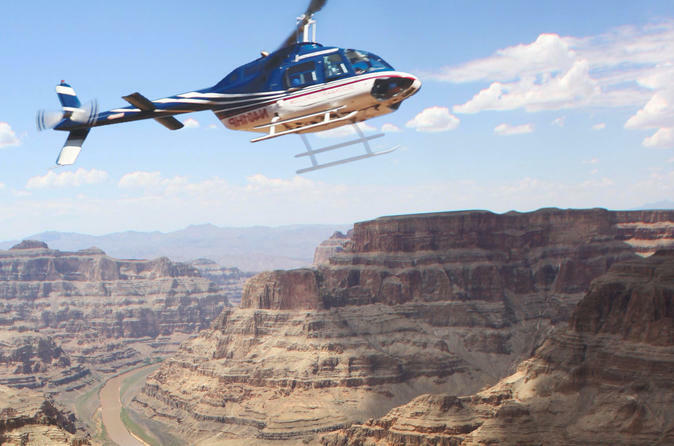 Enjoy a 20-minute flight through the Grand Canyon and take in incredible views of this natural wonder. Learn about the history of the ranch and enjoy a Western-style meal and entertainment for a true Old West experience. Upgrade to include a buffalo safari and feel like a cowboy as you explore the wilderness by horseback. After pickup from your Las Vegas hotel, you'll drive from Las Vegas passing by the Hoover Dam and Lake Mead through the Joshua Tree Forrest to the Grand Canyon Western Ranch in Meadview, Arizona. Your adventure begins with a wagon ride through the rugged desert to your helicopter where you'll get to see the grandeur of the Grand Canyon, one of the seven natural wonders of the world. Fly 1,500 feet (457 meters) below the canyon’s rim and soar through millions of years of geological time. Listen to the informative onboard commentary as you marvel at the canyon’s sheer size, brilliant palette of colors and rugged beauty. You'll then return to the ranch, an exclusive 165-square mile (265.5-square km) property filled with rich American history, you'll enjoy old-fashioned hospitality as you indulge a Western-style BBQ meal. Sitting on land that was once a part of the Mormon Trail, the ranch was settled by Wellington Starkey in the 1800s. Arrive at the ranch house in a horse-drawn wagon and meet real cowboy entertainers, who will share their legends and songs. Hear stories of real outlaws from the Old West who hid at the ranch and visit Starkey's small one-room house that is still situated there. Learn how the ranch has been passed down through generations and discover its Native American history dating back 3,600 years. Choose to go on safari (additional cost) with a 45-minute guided horseback ride through the Joshua Tree Forest along the historical Mormon Trail. On each Wild West adventure, take in the magnificent scenery and see buffalo roaming in their natural environment – truly a once-in-a-lifetime experience! After your Western adventure, enjoy a drive back to Las Vegas.